1) Why does Prince George wear shorts? It’s a ‘class-marker’ in Britain’s still-operating social hierarchy based upon wealth AND more importantly bloodlines. Young boys in upper-class societies are never seen in pants until they are aged 10/12 years of age depending on the size of the boy. Shorts mark a child as upper-class. Now you know. 2) Does Prince George wear hand-me-downs? Yes. Aristocratic families are thrifty by nature – imagine the budgeting required maintaining castles or grand estates? They invest in heirloom quality pieces (much as they invest in stocks, finely-bred horses, wines, and great pieces of artwork) and thus they are able to hand those well-made and expensive items down. Check out this shirt worn by Prince William and later worn by Prince George. 3) Why is Prince George’s style so traditional? Old money families dress their children how they were dressed. It maintains a sense of order and establishes each generation’s place within the tree of familial hierarchy. Check out this image of Prince Charles (Prince George’s grandfather and second in line to the throne and his sister the Princess Royal, Princess Anne, along with their parents the Duke of Edinburgh and HM the Queen). Compare to a recent family portrait of Prince George with his family. Notice anything familiar in the photographs above and below? The children wear the same types of clothing: peter pan collar, puffed, lined short sleeves, buttoned bloomers or shorts, ankle socks and buckle shoes, bodice stitched dress, puffed short sleeves, matching bloomers, ankle socks, and buckle shoes. In infancy, a traditional one-piece, 100% cotton, romper suit in traditional colors: white, light-blue, occasionally aqua-green, or checkered, with naval motifs. This is a social remnant from dressing aristocratic baby boys in girls’ frocks. Soft yet classic strapped shoes. Items with nautical themes: this is reminiscent of the old-fashioned sailor suits worn by aristocratic male toddlers. Shorts in all weathers under the age of 10. No exotic colors: navy blue, royal red, khaki brown. Double-seemed, buttoned, lined pockets, occasionally belts. One-piece, short-sleeved 100% cotton shirts with a Peter Pan collar, in boys under 3-years. Traditional long-sleeved or short-sleeved fitted cotton shirts in older boys: plain or checkered prints (red/navy blue). Knee-length socks in the winter. Peter pan shirt collars. puffed short-sleeves in summer and for male children under the age of two. Wool sweaters or cardigans in conservative colors: navy blue, occasionally royal red. 3/4 length, 100% wool, double-breasted coats. A New School for Prince George! The Duke and Duchess of Cambridge have chosen the co-educational (boys and girls) primary school Thomas’s Battersea, at $9k-a-term and 20 minutes from Kensington Palace. Interestingly they opted for the Battersea location (and not the Kensington branch where they reside) perhaps because Battersea is known for being a family-friendly, affluent London neighborhood. “Thomas’s Battersea is a busy, thriving, purposeful school, educating 540 boys and girls between the ages of four and 13. As you would expect of any Thomas’s school, the most important school rule is to ‘Be Kind’. We offer a rich and broad curriculum, with Art, Ballet, Drama, ICT, French, Music and PE all taught by specialist teachers from a child’s first day in school. The school is structured in three, three-year stages (the Lower, Middle and Upper Schools) within a framework of ‘Enjoyment, Learning and Achievement’, which informs a child’s journey through the school. According to the school’s website, boys in reception will need a navy jacket, a jersey and navy Bermudas to kick off the winter term. In summer, male pupils can switch their jumper for a short-sleeved shirt and white sun hat – available from Peter Jones at John Lewis. Games Kit for Year 3 upwards supplied by PlayerLayer. Two of the items Prince George will wear at his new school. Youngsters will also need to come prepared for messy arts and crafts sessions with a $55 art smock, and ballet shoes for dance lessons from the Royal Academy of Dance. Prince George wore two very classic looking yet affordable wool coats over Christmas. On Christmas morning the family went to St. Mark’s Church. Prince George wore this wool 3/4 length coat by Pepa & Co. In terms of footwear Prince George wore a pair of leather loafers called Barnie from Papaouelli. The shirt that Prince George wore in Canada and for Christmas lunch with great-grandmother Queen Elizabeth is available in the U.S! The brand is Neck and Neck, wine-checked Boys Shirt. And at a very affordable $20. Prince George wore a new jacket, the Redwink style from Amaia Kids. 100% wool. $90. Outfit of choice is: knee-high socks, classic shoes, shorts, cotton tailored shirt and knit blazer. Colors navy blue, sky blue and red, which are traditional colors. Prince George made a splash on his official visit to Canada along with his parents and baby sister. Although he appeared a little tired due to jetlag and strange circumstances (travel, crowds, new place) he held onto his father’s hand and powered on. The Cambridge family brand appears to be classic, conservative styles and traditional colors, especially shades of blue for Prince George. On his arrival he was dressed in a blue outfit from Pepa and Company. 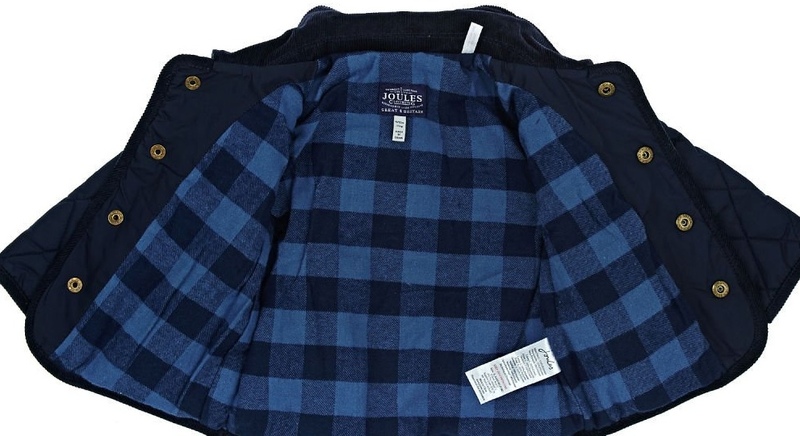 Here are the specifics: Boys Plaid Shirt in beige/blue ($50 ) and Sweater with Wooden Buttons in blue and the Spanish retailer’s Baby Baby Winter Shorts in navy ($50). Prince George was wearing a pair of the Start Rite John Lace-up Classic Shoes. Prince George’s socks are the Condor for Amaia Kids in navy ($9). The ‘Pantaloon Tenesis’ red shorts that Prince George wore on his last day in Canada are from Spanish brand Dona Carmen available at a very affordable price. Under $25. If red isn’t your color they are also available in camel and navy. The theme for one of the birthday shots by Matt Porteous is nautical. The brand is Pepa & Cola. This sweater is 100% cotton with a round neck, long sleeves, a plain striped back and four buttons on the left shoulder. It is currently selling at £29.40. You can buy it here. George’s shorts are also from Pepa and Company. Taupe, made from a cotton/linen blend, a good choice for this season. It is an elastic waist, two front pockets and cuffed hems. Both items are machine washable. The shorts come in smaller sizes, and they currently retail at £36 or approximately $47. Prince George gets to see some big planes with his parents! July 2016. On a first official visit for the royal tot, Prince George accompanied his parents to visit an air force base. On his trip he wore a classic white short-sleeved polo shirt. Similar style can be found here at Marks & Spenser. Retails in the U.K for 5-11 GBP. Comes as a two-pack. Prince George’s footwear sticks to a traditional t-bar theme in navy a canvas shoe with rubber sole. (Machine washable) Costs around $20. Prince George wore a pair of Mayoral belt shorts similar to the ones he wore at a polo match last year. Prince George meets a President! It isn’t everyday that Prince George gets to stay up late and meet an American President! This week President Obama and his wife Michelle visited the Duke and Duchess of Cambridge (AKA: Prince William and Kate Middleton) in their home. Photographs include Prince George riding on a rocking horse that the Obama’s had previously given him. Brand scouts who Royal Watch have identified the slippers and dressing gown that Prince George was wearing. Slippers: Trotters “Little Boston Plane” – unfortunately this line is last season and is not currently available. Contact the company for more information. Approx. $20-25. Dressing gown: My 1st Years a brand favorite with the Royal parents (see the first post featuring the brand at the bottom of this post). This gown is called Prince’s Personalized Gingham Robe. Approx. $35-40. Free Shipping to the USA!!! 5-10 day delivery. Take a photo with Great-Grandma! To celebrate Queen Elizabeth’s 90th birthday legendary American photographer Annie Leibowitz was commissioned to take an adorable portrait that is subject to restrictive copyright usage. But you can view that portrait here. It’s evident from all of the grand-children’s and great-grand-children’s attire that the style is always traditional. Prince George is sporting a typical outfit of another Fina Ejerique cardigan here at Burattino Kids, where it is discounted down to approx. $35-40. The shirt has a peter pan collar and is possibly a Rachel Riley design. The shorts are as yet unknown but the socks and shoes are likely Start-Rites, in the Jo navy leather, approx. $45-50, the Amaia Kids by Condor also in navy blue. Royal watchers everywhere got a treat when Kensington Palace released some adorable family photographs by John Stillwell of the UK Press Association. They were taken on a recent ski trip to the French Alps and it was the first time both kids had gotten to see some snow! See them here. Thankfully NYC is seeing some warmer weather but for those looking to ski in style this year with their little ones – here is the low down on what Prince George and Princess Charlotte were wearing. According to People magazine George was wearing the Mountain Warehouse Cloud All in One Snowsuit in navy. The snowsuit is waterproof and lined in fleece, with an elasticized waist, hood & ankles, as well as reinforced knees. It originally retailed at $119.99. Prince George goes to Montessori school! “The teacher, child, and environment create a learning triangle. The classroom is prepared by the teacher to encourage independence, freedom within limits, and a sense of order. The child, through individual choice, makes use of what the environment offers to develop himself, interacting with the teacher when support and/or guidance is needed. Multi-age groupings are a hallmark of the Montessori Method: younger children learn from older children; older children reinforce their learning by teaching concepts they have already mastered. This arrangement also mirrors the real world, where individuals work and socialize with people of all ages and dispositions. Prince George poses for a family photograph! More sweaters have been made by Fina Ejerique, the upscale kidswear Spanish brand. They are available for purchase at Margarita and Co., priced at 45€, roughly $50. The style is offered in sizes 12M to 4. Warning: the shipping is expensive. In some cases it is more than the item itself. On their visit to the museum the Duchess can be seen holding Prince George’s hand and stoops down to talk to him. View photographs here. Both the Duchess and the little Prince were dressed in smart casual. This is in a marked contrast to official outings. The less formal look enables the royals to move about in public without causing too much attention. This was a trend begun in earnest by the late Princess Diana. Prince George wore blue cords and a white collared shirt under a navy blue sweater and his Start Rite shoes. Little Prince George had a long fun-packed birthday on July 22nd 2015 including kicking the morning off with his maternal Grandmother Carole Middleton on a beach in Norfolk, U.K. The photographs of that morning can be viewed here on PopSugar. Prince George wore that classic English ‘countryside’ style padded jacket by the brand, Joules. Joules Baby Milford Quilted Jacket, here is a link to the item on Amazon UK. American browsers can find the item on Amazon U.S. This type of traditional English coat sports a light-blue tartan lining. Good for keeping out the late Summer/Autumn chills. This is a great coat for a little one on the go and it won’t cost you the earth. The jacket is 100% polyester and machine washable. It is currently on SALE at £25.95, or about $37. American shoppers can buy this item direct from the brand on their U.S site here. For anglophiles looking for the classic British sporting jacket in traditional green check out this Derby Waxed Jacket. Perfect for the cooler outdoor weather. It starts ages 2/3 and costs 45 GBP. 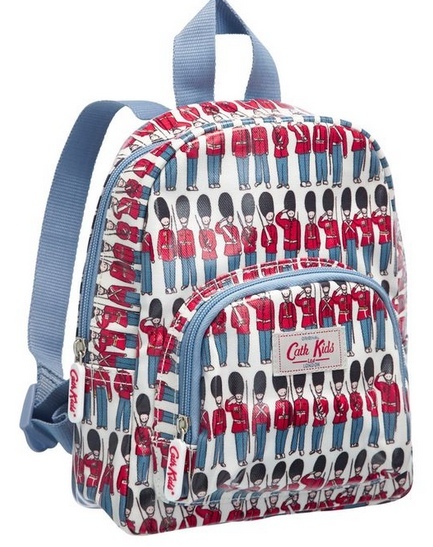 Prince George’s mini backpack is by Cath Kidston, This particular one is sold out (at present but check back on the site) but we found a couple of cute alternatives. Happy Birthday Prince George we are looking forward to a very stylish 3rd year! One of the highlights of a new Royal baby’s life is the ceremonial christening at Sandringham. At Princess Charlotte’s christening all eyes were on the infant in her traditional christening gown – a replica of the one used by Queen Victoria. The Duchess of Cambridge wheeled her daughter to the church in an elegant baby carriage once belonging to baby Prince Charles – Princess Charlotte’s grandfather. But perhaps the star of the show was Princess Charlotte’s older brother Prince George – simply because the public could see more of him. See more of Princess Charlotte here. Again – the Duchess of Cambridge has opted to dress Prince George in an almost identical assemble worn by Prince William at Prince Harry’s christening. This is not the first time the Duchess of Cambridge has mirrored Princess Diana’s choice in infant wear. Most of Prince George’s clothes from birth on hark back to his father’s childhood. It is worth noting however that even Princess Diana’s styling choices of her young sons were reflective of traditional royal themes of conservative cuts and colors. In this instance the brand Rachel Riley trumps as the #1 fashion choice for the royal couple when it comes to dressing their son on important occasions. This traditional 2-piece smocked shirt and short set boasts a shirt that is hand smocked across the chest with a vintage inspired design. Matching red shorts with button opening at the side – button onto the shirt for a formal look. Retails at 85 British pounds. Rachel Riley is currently predicting a 6-week wait on pre-orders of the set. Baby Does … NYC recommends that parents try other distributors of the Rachel Riley set such as Pepa and Company. Look on LOOK BABY 15 for Prince George’s outfit. It’s time for a spot of polo …. what is polo? Seems like Prince George is following in his father’s footsteps. Not only does he seem to know his way around a polo stick but he appears to have inherited his father’s left hand. Like any little boy his age Prince George had a lot of fun rolling down a hill. It appears that blue is a favorite choice for the royal family. But what is Prince George wearing? Another Spanish label for the royals (remember Princess Charlotte’s first outfit?) This time it’s from the label Mayoral. Boys navy blue fine ribbed cotton shorts by Mayoral with turned up cuffs, three pockets and a brown leather logo on the back. They have a popper fastening and around the waist is a navy blue and white woven, striped belt that can be removed and worn with other items. Now on sale for $33:07. Prince George presents Princess Charlotte in her first official portrait. View it here. In this royal photograph we see Prince George wearing the same outfit that he wore when he visited his baby sister at the hospital. A pair of blue socks by Amaia Kids and a shirt and shorts set by Rachel Riley. Little feet will not only be kept warm but will also look pretty in theses lovely stretch ribbed knit socks. Flat seams on the heels and toes to avoid skin irritation. Come in several colors to match lots of different outfits. Price: £7. Check out the long-sleeved shirt and shorts outfit that Prince George wore here. $159. Soft cotton and buttoned into shorts. Prince George visiting his new sister in hospital Rachel Riley cord short and shirt set navy blue knit button up cardigan knee-high socks Early Days Walker shoes. Last Christmas the British received an adorable seasonal card from the Windsors – young toddler Prince George sitting on the stone steps of Kensington palace. View it here. As usual the little Prince’s outfit was tip-top high-end with a classic nod to both history and tradition. But the great thing about this outfit is that it needn’t cost you the palace coffers to obtain. As we have observed in Prince George’s infant-wear the royal parents are opting for a classic look for their son. This is very much in vogue with apparel made to a traditional theme returns for both boys and girls. I am reminded of the 1930’s to the 1950’s with children attired in muted natural colors, using straight cuts and a conservative minimal amount of decoration. While the original tank top by Cath Kidston is no longer available there are two alternatives. The one above is called the Boy’s Animal Tank Top at $42. And this one Boy’s Sheep Tank Top at $42. Fortunately the little white body suit from Polarn O Pyret is still available. Dyed-through upper that keep the color, even after scuffing. Buckle fastening for adjustability and a comfortable fit. Leather linings to absorb moisture and help keep feet dry. Powell Craft navy blue knitted pram coat is made from soft cotton with ivory trims, two front pockets and wool covered buttons. It is perfect for wearing over tops and babygrows and is thick enough to be worn as a light pram coat. Number # 1 royal baby brand is : Rachel Riley. This British designer has enjoyed a spike in sales since the royal tour. To understand why, check out her adherence to traditional British cuts and styles. Her designs are very much rooted in the 1930’s-50’s, in high-end, aristocratic fashion trends. Riley understands the timeless iconic look that emerged from those decades and how they convey a message of tradition in George’s first tour. George wore the (above) Rachel Riley Striped Jersey Polo and these navy Pocket Shorts. They’re available for $69 and $89. The prince also wore his Early Days Alex Shoes. Below baby George is wearing Rachel Riley Sailboat Smocked Dungarees. The navy and ivory cotton dungarees retail for $129 and feature an elasticated waist and adjustable straps which cross over at the back. George also wore this £15 Trotters Milo Body. Infant George wore the Rachel Riley Moss Stitch Cardigan to avoid the chillier wind of Canberra. The $89 dark sky blue cardigan is 100% cotton with pockets. Set very much in the style of the 50’s this sweater connects the new baby to his traditional royal heritage. We can find numerous examples of a young Prince Charles sporting similar cardigans. In another nod to by-gone days George wears the Early Day shoes. The Leicester, UK-based company opened in the 1950’s and their styles have not changed much since then. Their online store is currently closed to orders but again check other online retailers and local outlets for stock. Below Alex shoes in both Navy Blue, and Ivory. Royal Baby brand 3: Annafie. Royal babies traditionally wear classic romper suits so George’s debut in New Zealand was no surprise. The White Romper Suit is now out of stock but the blue one is still available. Number 4 baby brand in terms of gifts is: My 1st Years. In a family’s portrait for Mother’s day this year, the prince sported a baby blue number with ‘George’ embroidered on the front. The company behind the sweater is coping with the unprecedented demand caused by this photograph, so bear that in mind when ordering. So – while the fashion choices for Prince George are firmly set in a traditional, classic past in terms of colors and styles the items themselves are not luxurious. These are garments all of us can afford. And that’s a pretty cool statement. Dressed like Princess Charlotte – where to buy the same outfits for your little Princess. He has the cutest baby outfits! You have listed some great resources for having your little boy be dressed like royalty. I will be checking several them out. These are absolutely adorable. Great Easter outfits. These outfits would be great when I have a little boy. I adore his outfits, thanks so much for posting where we can find similar items! These are really cute outfits. great idea to dress like prince george.